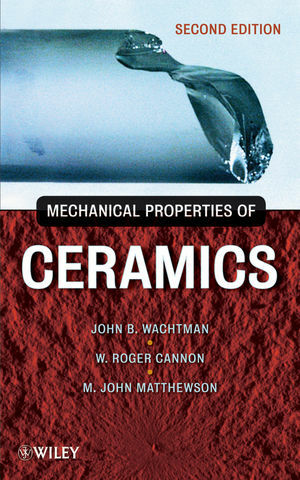 While maintaining the first edition's reputation for being an indispensable professional resource, this new edition has been updated with sketches, explanations, figures, tables, summaries, and problem sets to make it more student-friendly as a textbook in undergraduate and graduate courses on the mechanical properties of ceramics. W. Roger Cannon, PHD, is Professor Emeritus of Materials Science and Engineering at Rutgers University. He was previously on the research staff of MIT's Ceramic Processing Laboratory after receiving his PhD from Stanford University. His interests include mechanical properties, especially creep, sintering, and tape casting. M. John Matthewson, PHD, is Professor of Materials Science and Engineering at Rutgers University. His research interests include the mechanical properties and reliability of materials and, in particular, of optical fiber and fiber components. He also works on computational modeling of various materials-related issues, including processing, sintering, and lifetime calculations. 1.2 Tensor Notation for Stress. 1.3 Stress in Rotated Coordinate System. 1.4.1 Principal Stresses in Three Dimensions. 1.8 True Stress and True Strain. 2 Types of Mechanical Behavior. 2.2 Elasticity and Brittle Fracture. 3.2 Elasticity of Isotropic Bodies. 3.3 Reduced Notation for Stresses, Strains, and Elastic Constants. 3.4 Effect of Symmetry on Elastic Constants. 3.5 Orientation Dependence of Elastic Moduli in Single Crystals and Composites. 3.6 Values of Polycrystalline Moduli in Terms of Single–Crystal Constants. 3.7 Variation of Elastic Constants with Lattice Parameter. 3.8 Variation of Elastic Constants with Temperature. 3.9 Elastic Properties of Porous Ceramics. 4 Strength of Defect-Free Solids. 4.2 Theoretical Strength in Tension. 4.3 Theoretical Strength in Shear. 5 Linear Elastic Fracture Mechanics. 5.3 Griffith Theory of Fracture of a Brittle Solid. 5.4 Stress at Crack Tip: An Estimate. 5.5 Crack Shape in Brittle Solids. 5.6 Irwin Formulation of Fracture Mechanics: Stress Intensity Factor. 5.7 Irwin Formulation of Fracture Mechanics: Energy Release Rate. 5.8 Some Useful Stress Intensity Factors. 5.10 Cracks with Internal Loading. 5.11 Failure under Multiaxial Stress. 6 Measurements of Elasticity, Strength, and Fracture Toughness. 6.8 Elastic Constant Determination Using Vibrational and Ultrasonic Methods. 7 Statistical Treatment of Strength. 7.6 Effect of Specimen Size. 7.7 Adaptation to Bend Testing. 7.9 Example of Safe Stress Calculation. 7.11 Use of Pooled Fracture Data in Linear Regression Determination of Weibull Parameters. 7.12 Method of Maximum Likelihood in Weibull Parameter Estimation. 7.13 Statistics of Failure under Multiaxial Stress. 7.14 Effects of Slow Crack Propagation and R-Curve Behavior on Statistical Distributions of Strength. 7.15 Surface Flaw Distributions and Multiple Flaw Distributions. 8.2 Observed Subcritical Crack Propagation. 8.3 Crack Velocity Theory and Molecular Mechanism. 8.4 Time to Failure under Constant Stress. 8.5 Failure under Constant Stress Rate. 8.6 Comparison of Times to Failure under Constant Stress and Constant Stress Rate. 8.7 Relation of Weibull Statistical Parameters with and without Subcritical Crack Growth. 8.8 Construction of Strength–Probability–Time Diagrams. 8.9 Proof Testing to Guarantee Minimum Life. 8.10 Subcritical Crack Growth and Failure from Flaws Originating from Residual Stress Concentrations. 8.11 Slow Crack Propagation at High Temperature. 9 Stable Crack Propagation and R-Curve Behavior. 9.3 R-Curve Effects of Strength Distributions. 9.4 Effect of R Curve on Subcritical Crack Growth. 10 Overview of Toughening Mechanisms in Ceramics. 10.2 Toughening by Crack Deflection. 10.3 Toughening by Crack Bowing. 10.4 General Remarks on Crack Tip Shielding. 11 Effect of Microstructure on Toughness and Strength. 11.2 Fracture Modes in Polycrystalline Ceramics. 11.3 Crystalline Anisotropy in Polycrystalline Ceramics. 11.4 Effect of Grain Size on Toughness. 11.5 Natural Flaws in Polycrystalline Ceramics. 11.6 Effect of Grain Size on Fracture Strength. 11.7 Effect of Second-Phase Particles on Fracture Strength. 11.8 Relationship between Strength and Toughness. 11.9 Effect of Porosity on Toughness and Strength. 11.10 Fracture of Traditional Ceramics. 12.2 Basic Facts of Transformation Toughening. 12.3 Theory of Transformation Toughening. 12.6 Application of Theory to Ca-Stabilized Zirconia. 13 Mechanical Properties of Continuous-Fiber-Reinforced Ceramic Matrix Composites. 13.2 Elastic Behavior of Composites. 13.3 Fracture Behavior of Composites with Continuous, Aligned Fibers. 13.4 Complete Matrix Cracking of Composites with Continuous, Aligned Fibers. 13.5 Propagation of Short, Fully Bridged Cracks. 13.6 Propagation of Partially Bridged Cracks. 13.7 Additional Treatment of Crack-Bridging Effects. 13.9 Summary of Fiber-Toughening Mechanisms. 13.10 Other Failure Mechanisms in Continuous, Aligned-Fiber Composites. 13.11 Tensile Stress–Strain Curve of Continuous, Aligned-Fiber Composites. 14 Mechanical Properties of Whisker-, Ligament-, and Platelet-Reinforced Ceramic Matrix Composites. 14.2 Model for Whisker Toughening. 14.3 Combined Toughening Mechanisms in Whisker-Reinforced Composites. 14.4 Ligament-Reinforced Ceramic Matrix Composites. 14.5 Platelet-Reinforced Ceramic Matrix Composites. 15 Cyclic Fatigue of Ceramics. 15.2 Cyclic Fatigue of Metals. 15.3 Cyclic Fatigue of Ceramics. 15.4 Mechanisms of Cyclic Fatigue of Ceramics. 15.5 Cyclic Fatigue by Degradation of Crack Bridges. 15.6 Short-Crack Fatigue of Ceramics. 15.7 Implications of Cyclic Fatigue in Design of Ceramics. 16 Thermal Stress and Thermal Shock in Ceramics. 16.2 Magnitude of Thermal Stresses. 16.3 Figure of Merit for Various Thermal Stress Conditions. 16.4 Crack Propagation under Thermal Stress. 17.2 Qualitative Features of Fracture Surfaces. 17.4 Fractal Concepts in Fractography. 17.5 Fractography of Single Crystals and Polycrystals. 18 Dislocations and Plastic Deformation in Ductile Crystals. 18.3 Glide and Climb of Dislocations. 18.4 Force on a Dislocation. 18.5 Stress Field and Energy of a Dislocation. 18.6 Force Required to Move a Dislocation. 18.7 Line Tension of a Dislocation. 18.11 Orowan’s Equation for Strain Rate. 18.13 Hardening by Solid Solution and Precipitation. 19 Dislocations and Plastic Deformation in Ceramics. 19.2 Slip Systems in Ceramics. 19.4 Plastic Deformation in Single-Crystal Alumina. 19.5 Twinning in Aluminum Oxide. 19.6 Plastic Deformation of Single-Crystal Magnesium Oxide. 19.7 Plastic Deformation of Single-Crystal Cubic Zirconia. 20.3 Combined Diffusional Creep Mechanisms. 20.5 Combined Diffusional and Power Law Creep. 20.6 Role of Grain Boundaries in High-Temperature Deformation and Failure. 21 Creep Rupture at High Temperatures and Safe Life Design. 21.2 General Process of Creep Damage and Failure in Ceramics. 21.3 Monkman–Grant Technique of Life Prediction. 21.4 Two-Stage Strain Projection Technique. 22.2 Spherical Indenters versus Sharp Indenters. 22.3 Methods of Hardness Measurement. 23 Mechanical Properties of Glass and Glass Ceramics. 23.4 Elasticity of Inorganic Glasses. 23.5 Strength and Fracture Surface Energy of Inorganic Glasses. 23.6 Achieving High Strength in Bulk Glasses. 24 Mechanical Properties of Polycrystalline Ceramics in General and Design Considerations. 24.2 Mechanical Properties of Polycrystalline Ceramics in General. 24.3 Design Involving Mechanical Properties.